Nexans has expanded its innovative Connected Drums solution to new international markets, including the UK, Switzerland, Germany and Chile, building on its success in France and Belgium. The solution, first introduced in 2016 and developed with industrial Internet of Thing (IoT) specialists Ffly4u, enables customers to track the location of their cable drums with accuracy – reducing costs through improved efficiency and enhanced traceability. Nexans’ Connected Drum technology, the first of its kind in the market, uses 21stcentury technology to solve a key efficiency issue in the cable market. DSOs (distribution service operators) can lose hundreds of thousands of euros a year due to the lack of visibility of their drums scattered across construction sites. This is because complex supply chain processes can involve multiple teams, construction sites and subcontractors, so that expensive cable drums and cables are frequently lost, stolen or left idle on sites. It is also challenging for DSOs to monitor their stocks across multiple remote storage sites. 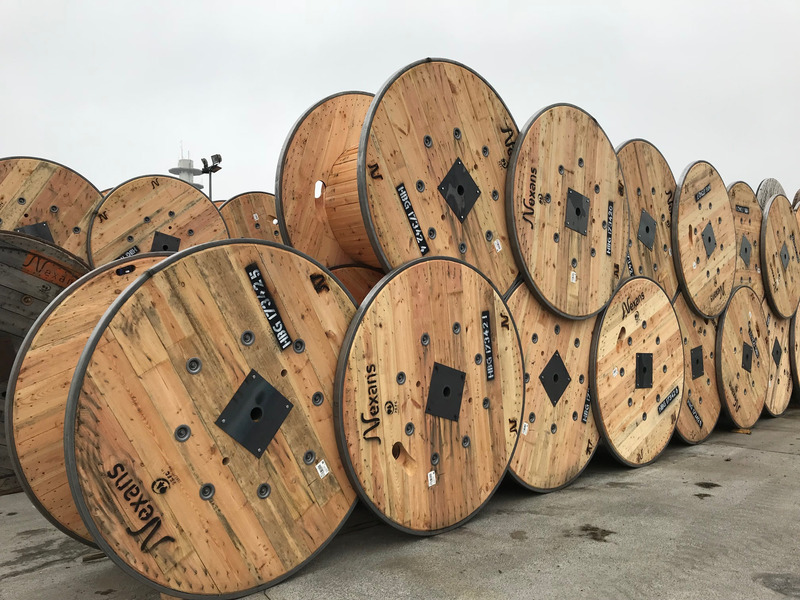 To help its customers address this issue, Nexans designed a digital solution comprised of a fleet of cable drums with integrated, tiny battery-powered sensors that connect each drum wirelessly to a cloud-based management platform (available on desktop or mobile app). This innovation provides customers with the real-time location of each drum as well as an alert system for monitoring on-site events, such as deliveries or pickup. As a result, the implementation of the Connected Drum service could lead to a reduction of up to 90 percent in the theft and loss of drums, saving hundreds of thousands of euros a year. The solution, however, goes beyond cutting costs through improving traceability. Nexans’ technology also allows customers to track how much cable is left on each drum. Thanks to a real-time interface between the connected drums platform and Nexans ERP (Enterprise Resource Planning) solution, the customer can monitor their drums and access business information such as cable type and remaining lengths, sites, stock levels and other important details. Multipe KPIs can also be visualised on dynamic dashboard. The platform helps to reduce the amount of time that empty drums are left on site waiting for pickup, saving on costs and working capital. Estimates show that the Connected Drum technology can reduce the rotation cycle (the time it takes to return a drum back to Nexans) by as much as 25 percent – improving efficiency for both customers and Nexans. Due to the success it has seen with existing customers in France and Belgium, Nexans is now offering the Connected Drum service to an increasing number of countries. The sensors are quick and easy to install, meaning the technology is scaleable and can be deployed quickly in new markets. Nexans currently uses the cloud-based solution in six countries (UK, Switzerland, Germany, Chile as well as France and Belgium); however, it expects this number to grow as companies take advantage of this digital service to improve efficiency and lower costs. The Connected Drum technology is part of Nexans Services & Solutions designed to deliver more value for the Group’s customers by streamlining all cable-related activities of their projects. Building on decades of experience in cabling, supply chain and engineering, Nexans offers its customers innovative services and digital solutions aimed at contributing to their operational and financial performance.